It was built fort he ‘Rumelian Kazasker Mehmet Efendi who was the grandson of Haci Hasan, Exact date of its construction is not known. Its deed of truct was arranged in 1505 with the signature of Mevlana Abdurrahman bin Aliyy’ul Mueyyed. 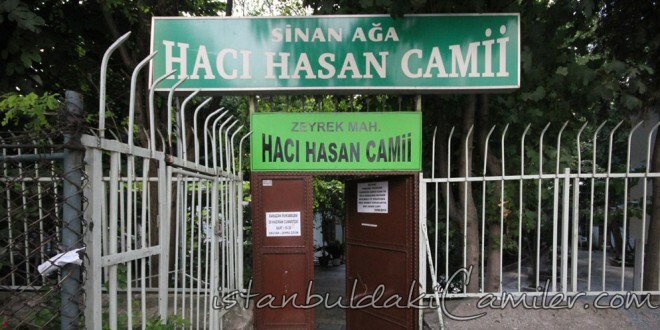 Althought it is written in Hadikat’ül Cevami that Kazasker Mehmet Efendi died in 1505 and that his tomb was nearby the mosque, his tomb was lost since some part of the cemetery was turned into a children’s park. Evliya Celebi talks about it as a sumptuous Mimar Sinan mosque. The minbar of the mosque was later built for Sheikh ul-Islam Kara Ismail Efendi. It was built of limestones with a wooden root. Since the land is sloping its minaret that is on the right side of the mosque is called as “the Leaning Minaret”. According to its repair inscription which is stil preserved, the mosque was burned 1852 and it was renovated by the help of Huseyin Aga. The late ‘Reisu’l kurra’ Mehmet Efendi of Gönen served in this mosque between the years 1950-55.